LOUISVILLE, Ky. — Ninth-ranked Clemson outlasted Louisville, 20-17, in front of 55,396 fans, the third-largest crowd in Papa John’s Cardinal Stadium history, on Thursday. The win improved Clemson to 3-0 on the season, and was the program’s 30th straight victory over an unranked opponent. 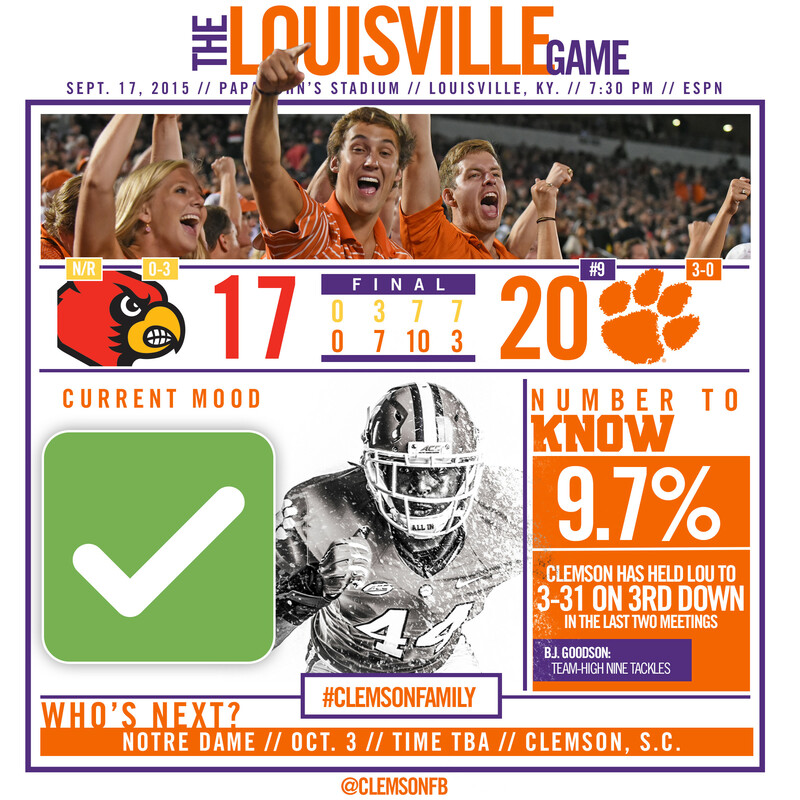 Clemson’s defense was outstanding all night, allowing just 272 yards of total offense to Louisville. The other story of the game was running back Wayne Gallman, who carried 24 times for 139 yards on the evening. He helped offset a pair of interceptions thrown by Deshaun Watson, who ended the night 21-30 passing for 199 yards. He added a season-best 54 on the ground. The defensive struggle was uncorked momentarily after the completion of the first quarter, when Watson found a streaking Hunter Renfrow wide open for his first career touchdown. The redshirt freshman caught the 32-yard strike to put the Tigers ahead, 7-0. The Cards cut the deficit just before the break when John Wallace connected on a 26-yard field goal. Louisville took its first lead on a Jeremy Smith one-yard plunge in the third quarter, which was set up by Watson’s second interception of the evening — his first career game with multiple picks thrown. The Tigers responded, posting 13 consecutive points that included Watson’s 25-yard touchdown pass to tight end Jordan Leggett. His fourth career score combined with two Greg Huegel field goals to make it 20-10. Seemingly in control, the Tigers allowed a 100-yard kickoff return that gave the Cardinals life with 9:41 to play. Louisville marched into Clemson territory on its next drive, but John Wallace missed a 38-yard field goal. The Cards had another chance late, but Kevin Dodd’s eight-yard sack erased it and Louisville’s final throw was intercepted by Jadar Johnson. Clemson is now off consecutive Saturdays before returning home to host Notre Dame on October 3. Kickoff time will be announced at a later date.